National Geographic is known for being at the forefront of exploring our solar system and constantly looking for answers to the mysteries of space. It has documented some of the most historic moments in space like Cassini plunging into Saturn, the cosmic journey of the celebrated science instrument Hubble and a series set in 2050 of life on Mars. 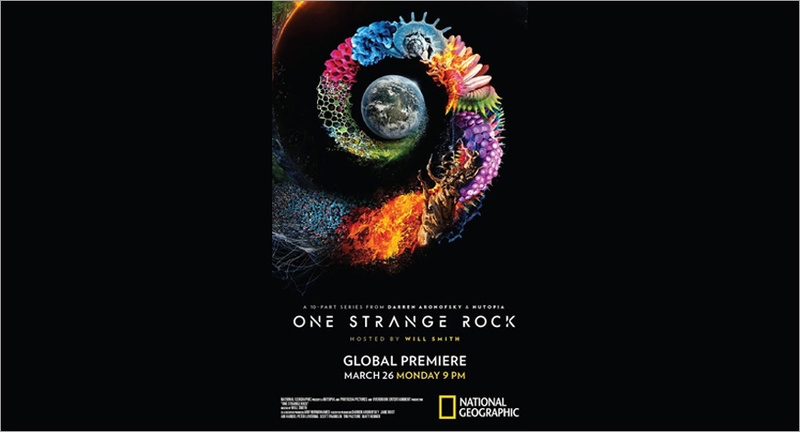 Now, the channel is all set to takes viewers on a journey to witness life on our very own planet earth through a cinematic event series- One Strange Rock. The series has been created by acclaimed filmmaker Darren Aronofsky (Black Swan, Requiem for a Dream). The show explores the fragility and wonder of planet Earth, one of the most peculiar, unique places in the entire universe. It’s the extraordinary story of why life as we know it exists on Earth, brought into perspective by the only people to have left it behind – astronauts. Hosted by Academy Award-nominated actor Will Smith, this global event series will premiere on National Geogrpahic across the world on Monday, March 26 at 9PM. This first-of-its kind 10-part series brings cameras where they’ve never been before, having filmed for 100 weeks in 45 countries spanning six continents, covering from the depths inside the earth to outer space on the International Space Station (ISS), from oxygen producing bacteria to blue whales, new born baby’s first breath to ancient mummies and other extreme locations and human stories, so that audiences see and appreciate our planet as never before, according to the channel. “The series will be Cosmos meets Planet Earth meets Gravity – on steroids,” says Courtney Monroe, CEO, National Geographic Global networks. Commenting on the series, Swati Mohan, Business Head, National Geographic & Fox Networks Group India said, “One Strange Rock comes at a time when we need people to appreciate our planet, its wonders as well as its vulnerabilities. The idea is to evoke a sense of wonder about our planet that audiences would perhaps have never experienced with anything they have seen before. The series is the coming together of the best of National Geogrpahic elements - world class story-telling, talent, science and spectacular visuals – all working perfectly to unravel the mysteries of the world around us and take the viewers on this quest to understand our planet better”. National Geographic reaches to about 139 million television viewers in India every month. The channel is available in 5 languages, and on all distribution platforms in the country.